Book of Demons :: Legendary Update! The wait is over! The card system update is finally here. I will try and break down the main changes. Buckle up. The first thing you will notice is that all your cards are now of common rarity. Yes, you read that right, the old common/rare/legend system has flown out of the window. All cards you knew are now common. Additionally, all unidentified cards you might have had before the patch will be identified at no cost, you will find then in your inventory after starting the game. From now on every card can be found in multiple variants. The common rarity has to be found first. After that, there is a small chance that a rare more powerful variant will drop. There are two variant rarities: Magical and Legendary. Each rarity has modified icon and card template. Magical and Legendary cards use silver and golden templates respectively. Those used to indicate card level, which now will be indicated with stars on the left side of the template and card icon. Mighty Blow of Tsunami - the Tsunami variant will cause all shockwaves generated by the player to be bigger. Effect does stack. Left-winged Mana Potion - the Left-wing variant secures the card to the left of it and that card can't be cursed by a boss! However, if this variant gets cursed and disabled the protection expires. 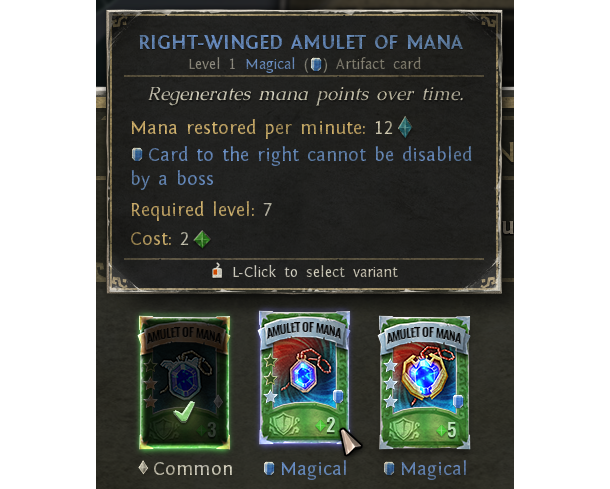 So if you have that one crucial card that must be protected against curses better find the Right-wing variant as well! Each card has at least one legendary variant with a very low drop rate (and guaranteed drop from a Quest Boss, making the quest mastering a potentially profitable activity. Once it's added to the game, that is). There are rumors about a legendary Hourglass card that has the power to prevent caster’s death when active. In the event of death it is supposed to be able to reset health and mana to levels from the moment of casting. And it is also said to reset him back in space to the spot he was standing at the time of casting. Then there are stories of a legendary amulet that damages monsters standing near to a picked up health globe and self-replicating chain ice bolts. Surely most of them are just exaggerated nonsense and hearsay. Then again we have the dead swarming up from under the cathedral and no one believed that could happen either. So who knows. Each card variant has to be upgraded separately. Some variants' effects improve with card levels, other's don't. Since this means a lot more occasions for upgrading more rune cards will be dropping in dungeons and we also introduced card downgrading. Each downgrade costs gold and returns random rune cards. Two rune cards for downgrading a Magical and three for a Legendary card. This means that if you are lucky when downgrading you might get better rune cards than the ones you invested into the upgrade! So how does all that work? Once you find a variant of a common card, a stack of cards will appear under it in the Card Pane. Since each card now has only one active variant, the variant you see on top is the active one. You can change it using a small button that will appear near the bottom of the card. How does this mesh with other mechanics? When the card is cursed or disabled in another way all variants are affected. When the card is in tombstone all variants end in that tombstone. However, when the card is destroyed on higher difficulties, only the active variant is destroyed. Until now standing in fire boiled and depleted mana pool over time. Since no one needs additional encouragement not to stand in the flames we modified this mechanic. Now Mana Burn is a special Demons’ skill on Hell tileset. Whenever demons hits you a flame is struck under the mana pool. When there are three flames each consecutive attack from a demon burns one mana point. Of course, flames under mana pool eventually die out, the trick is not to get hit by demons multiple times in a short period of time. The most important aspect of this revised mechanic is that even the green mana is affected by it. This means that damage coming from demons can disable your equipped artifacts! As the mana level drops artifacts on the right will be mana starved first. Once you replenish your mana they will automatically activate again. This means that now order in which you equip artifacts matters on hell tilesets and demons will be more challenging there, too. You have been warned, watch your mana pool. It was long in the making but we have also redone how the cauldron works. Before every three rewards of one type were converted to one reward of a higher tier. It was confusing since it was not obvious if that silver reward will be better than three bronze ones. That’s why now for every three rewards of the same type one reward of the higher tier will be added but the three rewards stay in the cauldron! 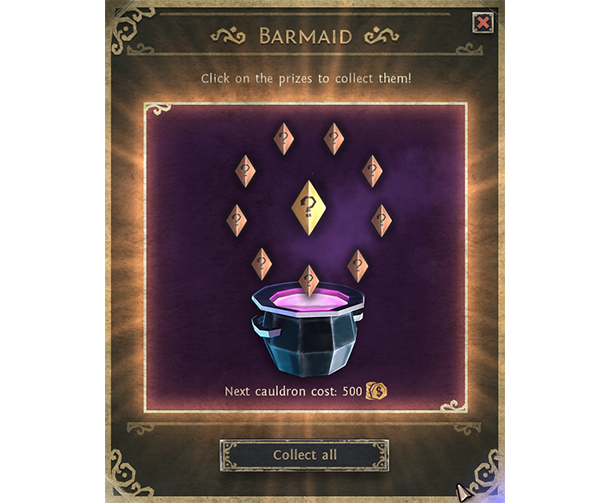 This means way more rewards with each cauldron buyout! Of course beside the big things listed above we added a ton of stability improvements, bug fixes and general polishing like autumn leaves in the town. You can read full changelog in the game and in the forums. This is a big update that includes refactoring of many core system and game logic. We expect to be working on balancing and general bug fixes during the next week. Keep the reports coming in! Once things settle we will begin work on the Rogue. The careful estimate for Rogue’s release date is one and half month from now. She is already implemented but in the light of recent changes to the card system and all the polishing and tweaks we did to the other to classes we believe some of her cards can be more awesome. This update was not initially planned but once the idea of adding more variety to card system came up during the early access we knew it has to be done. Now that it’s behind us we reevaluated the production and marketing plan and it looks like the launch will happen in Q3 2017. I stumbled upon this game by accident. Holy crap how did I not know this existed for so long. This game is amazing and deserves WAY WAY more exposure. I hope you guys sell 100,000! 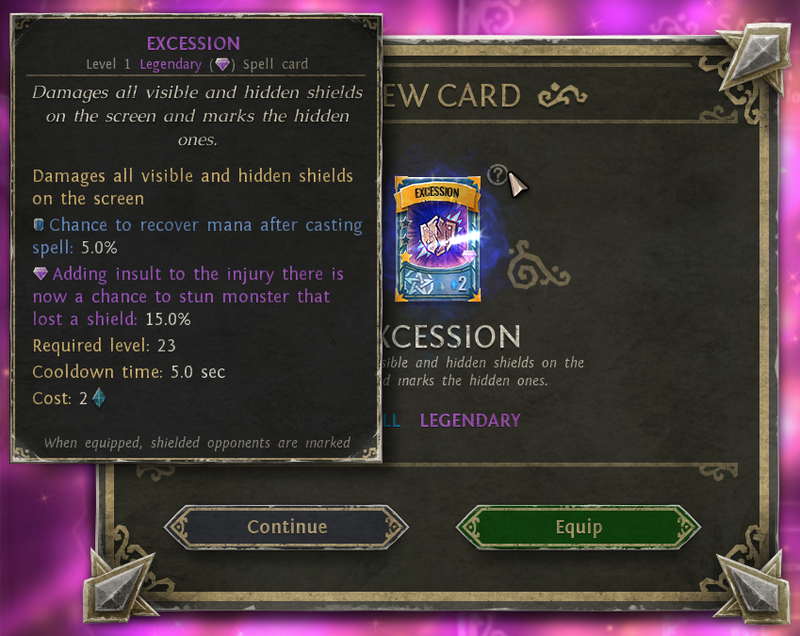 @lanz @Nagumo Most cards have one legendary variant right now. Town portal has two or three. And each card has multiple magic variants. @Nagumo, there are multiple variant for magical cards, but i'm not sure about the legendaries, i haven't found multiple of them for the same card. Does that mean, that there are more then one variant of magical cards (and even of legendary)? Or is there only 1x common / 1x magical / 1x legendary of any cardf (and this way 3 variants of each card)? I'm spacy because first you are talking of only two variants for each card (magic and legendary) and later you are talking in the example of a right and left wing variant. How will the card find / upgrade achievements work (e.g. find all Level 1 cards for <class>, upgrade all cards for <class> to level 2)? Will we need to find / upgrade all variants?